This is a white coffee mug with no maker's mark; there is a sticker on the bottom that says "Made in China". The handle is shaped for the picture of the flowers, tulips, that it has on it. 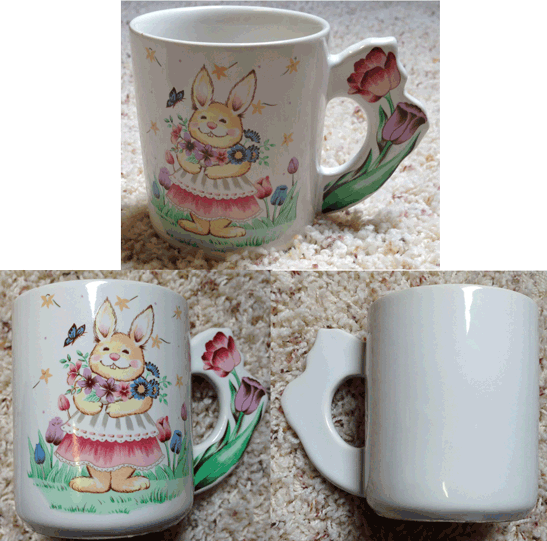 The main picture shows a very happy content looking brown bunny, wearing a dress and apron, with an armload of flowers. Yellow flowers float in the air around her, and a blue butterfly looks like it's getting ready to land on the flowers in her arms. She stands on a green field of grass with tulips in the background. The pictures appear to be decals that are glazed on. I don't believe this cup has ever been used, and it is at least 20 years old. It's 3.5 inches tall, and about 5 inches across at the widest part of the handle. It weighs 12.6 ounces. This little rabbit is still in a plastic bag - I took him out to photograph him. He looks brand new. He has blue eyes and pink ears, nose, and feet. The nose is a different color of pink. The front paws are sewn together in a way that looks like you can slip something in behind them for him to hold - a card, or maybe even an engagement for someone planning to propose. It would be a good gift wrapping box for a small gift, to be tucked behind his front paws. Importador: Distribuidora Cornersa, S.S. de C.V. He's about 8 inches tall,, not including the ears, and 7 inches across at the feet. He weighs 7.1 ounces. 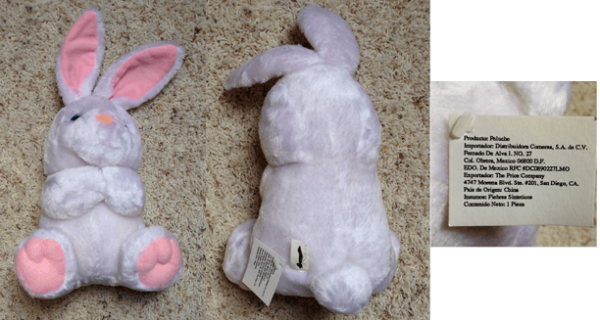 This "brand new" bunny is at least 20 years old.